We've seen most of the entries now for this year's F1 world championship with teams unveiling their cars designed to the new rules. Overall the cars are not perhaps as spectacular looking as we were led to believe, not as dramatically far removed from what went before, which is slightly disappointing. They look very large in the flesh and will clearly be much faster, which fans will certainly see at the track, but may not perhaps not carry across so much on TV. The obvious details like wider chassis, wider tyres and lower rear wing are pleasing to look at but there is still plenty of scope for F1's sporting MD Ross Brawn to work on over the coming years to specify a new generation of cars that look extreme and exciting. A lot of the wings and basic bargeboards we've seen in the launch pics are just placeholders and over the next month before Melbourne you will see a lot of developments through testing on these areas. We've seen already that the area around the bargeboards is going to be a real talking point and area of development focus this year. The front suspension is an area with several different ideas going on. But the part we cannot see, but which probably is the most critical, is the floor and the diffuser. This will do a lot more work than before and generate more of the downforce. Expect photographers to be briefed to get any shot of the underside of a car on a crane that they can. There has been a lot of talk about the fins returning to the engine covers, which generally look ugly and are not popular with fans and many insiders. These could be dispensed with during 2017 as they play only a minor role in the aerodynamics, certainly less than they do on the aesthetic side. A few things are clear already; Mercedes had a lot of time on its hands during 2016 to curate and develop its 2017 car; having had such an advantage over the field they could keep everyone at arms length with basic developments, but at the same time they devoted most of their time and resources to the new car. That is a luxurious position to be in and it's probably the last year they could do that, as they'll be in an arms race of development this year through to season's end, one suspects. The solutions on the Mercedes are very well developed - for example the front suspension, with the innovative top bracket and the highly curated side vane and bargeboards (below). This is an area of the car where the new rules allow some freedom to experiment and as it is a critical area in terms of shaping the air flow around the car and to the floor, it's where we will see huge development this year. Mercedes has lengthened the wheelbase of the car by 15cm compared to the 2016 model to maximise the potential of the floor. It has made conscious decisions, like not having a blown axle, which helps airflow around that car, because that entails a more complex wheel nut which can slow down pit stops. And with what we know of the gains they have made on the engine side, they surely will start as favourites again this season. 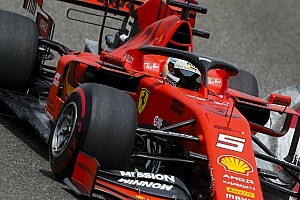 Ferrari has had some stick since the Schumacher years for not being bold enough and not leading the way on innovation. Well they have certainly gone out on a limb with the new car, with some very extreme ideas around the leading edge of the floor, the turning vanes and the side pods. There are complex and sinuous shapes and flow structures here. This will either work brilliantly and lead some others to copy their ideas or they could lose some time chasing their tales to get the aero to work. Clearly they are banking on a heavy development programme in this area of the car and they obviously think they have found something. In contrast to Mercedes, they have not lengthened the wheelbase. Until the car covers some real mileage in Spain starting tomorrow, we will not know which is the true scenario. Ferrari has worked very hard on its car, despite the fact that they also kept pushing on the 2016 car until quite late in the season. There is also the question of the upheaval in the technical department with a new head of aerodynamics who comes from outside F1. The engine was the best part of the Ferrari the last two years and once again they are expected to have plenty of power from the new engine. It's the efficiency of downforce and driveability which will be the watch points for this new Ferrari car. Red Bull revealed a beautiful looking car on Sunday and this is the one that most insiders expect to take the fight to Mercedes this season. There are some important things to note about the background story to this car. One is that the new 2017 rules, with their greater emphasis on aerodynamics, re-engaged the interest of Adrian Newey, who had got bored with the engine dominated F1 of 2014-16. This can only be a positive for the team and if one looks at the progress of the 2016 car aerodynamically, then the expectation is that this car will be at least the equal of the Mercedes. "Whether we have prioritised in the right areas or not, time will tell," Newey said in an interview last week. It's not just about generating huge downforce; this car is likely to be very efficient aerodynamically, meaning it can run at many venues with less than maximum wing levels and can trim the car accordingly. This is the opposite of the situation they had in the Vettel Red Bull V8 blown diffuser era, when they would tend to run maximum wing almost everywhere for cornering speed; get pole and then break the tow in the opening laps, winning the race, despite the fact that the car was one of the slowest on the straights because of the downforce levels. "[This year] We get a lot more freedom from areas of the car that can deliver performance and we always like to have the ability to play around with these areas," said Red Bull's aero chief Dan Fallows. The key to their challenge will be Renault's new engine. Our sources suggest that Renault has found around 40kW from the engine, which is worth more than the three tenths of a second Cyril Abiteboul spoke about at the Renault launch. It's closer to four tenths/half a second. Against that there was a concern with reliability this week when Red Bull's junior team Toro Rosso suffered an engine problem at its shakedown/filming day test, which proved a showstopper. Clearly they are pushing to the limit. Nevertheless the word on the industry grapevine is that Renault has done a very good job with this engine and so we would expect Red Bull to be able to be close on Mercedes from the outset of testing this week. The unknown is how much Mercedes had been holding back in reserve on the engine side last year and where the gains with the new engine therefore take them to. McLaren we spoke about on Friday and despite having little in the way of serious sponsorship on the car, the team has a budget to compete from the shareholders and a stable aero group under Peter Prodromou that looks to have produced a good car, building on the detailed work of 2016. Honda says they will start the season at the level of engine performance Mercedes had last season, which is a challenging idea as Mercedes was holding back its true performance. But based on the performance which could be measured, Honda feels it will be there. There is inevitably a lack of refinement compared to Mercedes, because they are still playing catch up, but any slip ups from Ferrari and McLaren will be there. Williams is very much a team in transition as it unveiled its car this weekend. The Grove squad slipped from 2014 to 2016 from third to fifth and it will take a big effort to finish higher than that this year. As well as Pat Symonds, who oversaw this 2017 car's development, the team has dispensed with heads of aerodynamics, production and is revamping the technical management. Dirk de Beer, who worked with James Allison at Ferrari, has come in as the new aero chief. Paddy Lowe will soon join the team. Meanwhile on the driver front they have a rookie in Lance Stroll and a 'retired' driver coming back in Felipe Massa, so it's hard to see them scoring enough points to finish top four. Haas has also revealed its car this weekend in some generic launch shots. More details on this as the testing starts next week, as with Toro Rosso, whose car was rolled out on Sunday night and which is striking in blue. Powered by a Renault engine and with some nice looking aerodynamic cues and two very good drivers, this car could be a bit of a dark horse in the midfield. Which is your favourite F1 2017 car so far?